Here is a major new studio recording of Weber�s exotic supernatural three act opera Oberon. Philips have assembled international forces conducted by period instrument and historically informed performance specialist Sir John Eliot Gardiner. The Swedish soprano Hillevi Martinpelto, German tenor Jonas Kaufmann and Australian tenor Steve Davislim were all engaged to lead a distinguished cast in this enigmatic mythical drama. The studio recording was made at the Watford Colosseum following critically acclaimed concert performances and is said to be the first to be recorded in an English language version. Weber was a reformer whose goal was to make opera into a total work of art - musical, literary, dramatic and stenographic. In this sense he anticipated Wagner, who admired him greatly. As a composer Weber was a progressive who rejected well-worn Italian operatic formulae in favour of a new, intensely Romantic and specifically German style. This was in fact a cross-breeding of late eighteenth and early nineteenth century French opera with popular German Singspiel, in which sung pieces alternate with spoken dialogue, a form that had reached its artistic peak in Mozart�s The Abduction from the Seraglio and The Magic Flute. In Weber�s three best-known operas: Der Freischütz (The Free Shooter), Euryanthe and Oberon, all completed in the early to mid 1820s, the musical depiction of nature became an important element, and an atmosphere of the supernatural and of fantasy wafted onto the stage. It is no wonder that Weber�s operas so powerfully influenced the next generation of Romantic opera composers, especially Berlioz and Wagner, just as his evocative instrumental writing, in his concert and salon pieces as well as his operas, influenced Mendelssohn, Chopin and Schumann. Sadly, Oberon was to be Weber�s swansong as he was to die in London only six weeks after the London première. The unqualified success of Weber�s opera Der Freischütz (The Free Shooter) in 1824 in London brought about a commission from Covent Garden to write a new opera. Billed at its Covent Garden première in 1826 as, �A Grand Romantic and Fairy Opera�, Oberon, is a spectacular in twenty one scenes and lavish sets with a large cast. The libretto, in an English text from James Robinson Planchéis, is based on a translation of Oberon by the German poet Christoph Wieland, itself based on a medieval French chanson, with the addition of Shakespeare�s Fairy King Oberon and the mischievous Puck. The ridiculous plot follows the well used fictional world of the heroic Christian Knight against the shadowy Muslim Caliph of Baghdad. The action jumps uncomfortably from Oberon�s bower in fairyland to France, to Baghdad, a ship, a rocky Mediterranean island, and to Tunis. The opera ends triumphantly in the court of Charlemagne. Oberon is full of a rich variety of musical styles and mixes some of the familiar fantasy characters of Shakespeare�s A Midsummer Night's Dream with trials of love in exotic settings. Along with Weber�s best known opera Der Freischütz, enormously important in the development of the genre of opera, Oberon manages to link the world of Mozart�s Magic Flute with the music dramas of Wagner. Unfortunately it is often said to lack sustained interest and suffers from a deplorable libretto. It was famously damned by musicologist Donald Tovey, who claimed that Weber had poured his finest music into a pig trough. In its best pages Oberon reaches a summit that few other operas attain. It is at its best in the overture which is a magical excursion into the kingdom of fairies, sprites and elves, continually touched with the mystery and wonder of the forest. It seems clear that the young Mendelssohn must have been influenced by this when he composed his Overture to �A Midsummer Night�s Dream� Op. 21 in 1836. In the delightful overture Gardiner and his orchestra combine sharply observed detail with wonderfully natural and unaffected playing. The inclusion of a narrator is a successful move; the role is taken by English actor Roger Allam, acclaimed for his many appearances with the Royal Shakespeare Company. Tenor, Steve Davislim, as the fairy King Oberon in the opening Aria, scene no.2, Fatal vow! is a disappointment and seems rather nervous with noticeable wobble in his voice. The part of the Oberon is rather curious as the character is hardly employed in the score. As the noble Knight, Sir Huon of Bordeaux, the tenor Jonas Kaufmann is a first-rate casting. In one of my favourite moments Kaufmann is in fine voice in his romantic Aria, scene no. 5, From boyhood trained with strong, direct and expressive singing and an appealing timbre to his voice. Another highlight is Reiza�s wonderful set piece Aria, scene no. 13, Ocean! thou Mighty Monster. Soprano Hillevi Martinpelto, as Reiza soars beautifully to the heavens and the rich and smoky timbre of her voice is most attractive. In Fatima�s popular Aria, scene no. 15, O Araby, dear Araby, my own native land! the mezzo-soprano Marina Comparato displays her smooth and velvety voice with considerable clarity. The orchestral contribution really sparkles and the playing and singing is beautifully tailored to the score drawing out an endless kaleidoscope of subtle colours. The sound from the Philips engineers is top quality. The company is also to be congratulated for a superb presentation providing full texts, a synopsis and superb essays. 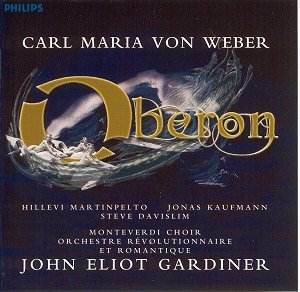 Under the baton of Sir John Eliot Gardiner, Oberon is a delightful experience and deserves to heard by a wider audience.